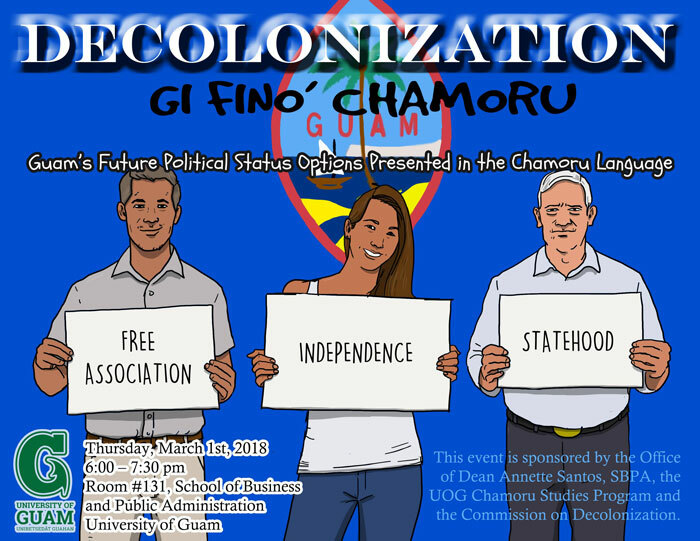 On Thursday, March 1, 2018, 6:00-7:30 p.m., the Dean of the School of Business and Public Administration at the University of Guam will host a CHamoru-language panel from the Commission on Decolonization to discuss the status options for Guam/Guåhan: Statehood, Free Association, and Independence. 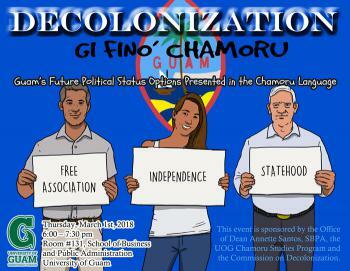 The event is called “Decolonization gi Fino’ CHamoru” (in the CHamoru language). It will be held in Room 131. It is free and all are welcome and encouraged to attend. The panel, co-organized with Commission Director Amanda Blas from the Office of the Governor of Guam, will include special presentations gi Fino’ CHamoru (in the indigenous CHamoru language) from representatives of the Taskforces on Statehood, Free Association, and Independence. Handouts and other educational materials in English will also be available. The taskforces are directed to conduct public outreach and education on issues of decolonization and self-determination. Support and occasional funding for their efforts is provided by the Government of Guam and the U.S. Department of the Interior, with the invaluable work of dedicated volunteers from the community as well. The past year and a half has seen increased public awareness and government funding for the pursuit of CHamoru self-determination, as well as court cases and community protests. This panel offers an important opportunity to celebrate and perpetuate Guam’s indigenous culture, language, and traditions, while also foregrounding the discussion of CHamoru decolonization. Mr. Eddie Duenas and Mr. Eloy P. Hara are the chair and vice chair of the Taskforce on Statehood; Mr. Adrian Cruz is the chair of the Taskforce on Free Association; and Ms. Victoria-Lola Leon Guerrero and Dr. Michael Lujan Bevacqua are the co-chairs of the Taskforce on Independence. This event is free and open to the public. A question-and-answer session will take place following the panel. Previous post ← Sangåni si Nemsy Necrofizzle Håfa Adei!